This is where it all starts to happen. Once you get people through the door you must make the most out of every opportunity. You must turn those prospects into sales. Conversion rates are often given little thought by the average business owner, and invariably when I ask someone out of the blue, they take a guess. That’s not good enough – you have to start measuring it NOW. Regularly business owners massively overestimate the percentages… I remember one who guessed they sold to “80, 85 per cent of people” who called or came into their business. After some serious testing and measuring we discovered it was nearer 35 per cent. It was huge shock to the owner, but it also represents a tremendous opportunity. Think of the bottom line difference you can make by significantly boosting your conversion rate. If you can take your conversion rate from 30 percent to 60 percent, BAM, you’ve just doubled turnover. 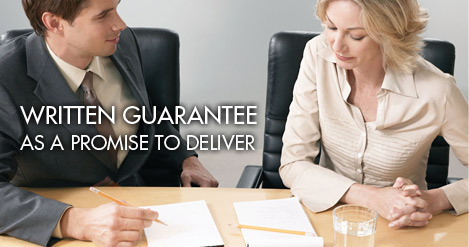 This is where you write a guarantee addressing the customer’s key frustrations in buying from you. If it is, offer to refund their money, or put things right. Once you’ve finalized it, make sure you tell people, and advertise it. Find out what your customers want above all else, and then promise to deliver just that. The best way to find this out is by listening to your customers…they’ll tell you. Include this promise in all your literature and advertising – make it a real selling point. If you don’t deliver on the promise, make sure your team are empowered to correct it or offer a refund. Don’t ever promise more than you can deliver.